Steven Spielberg‘s movie Lincoln and Doris Kearns Goodwin‘s book from 2005 entitled Team of Rivals are both respectful appreciations of a quiet man who did extraordinary things. What are some of the lessons we can extract from a closer look at our 16th president? According to Bloomberg Businessweek, there are five behaviors of President Lincoln that we would be smart to practice when managing ourselves and others. What many don’t know — I certainly didn’t — is that the Emancipation Proclamation was issued under Lincoln’s war powers and thus did not establish a ‘legal basis for abolishing slavery across the nation.’ He knew that once the Confederates were readmitted into the Union after the war, ratifying it as an amendment (the 13th) to the constitution would have had no chance of succeeding. Wisely, Lincoln ‘pushed to get it through Congress before the fighting ended.’ While this meant the Civil War dragged on longer than it would have otherwise by delaying a peace delegation with the Confederates, it ensured the Proclamation would pass. What a masterful job of understanding your objectives and being able to clearly see how doing one thing allows you to accomplish another. Even if they don’t trust you or agree with you, as Ms. Goodwin points out, by letting your staff do its work, you can achieve great things you could not do on your own. I’ve written before about Royal Little, founder of Textron, one of the world’s first conglomerates, who famously once said that he achieved his successes by hiring people to do what he couldn’t, which was considerable, as it is for most of us. Ms. Goodwin’s best-selling book tells a fast moving story of how political rivals, working at the behest of President Lincoln, who set the agenda and ‘clarified the moral underpinnings of the Proclamation,’ was able to extract the best from each Cabinet member to allow him to achieve his goals. Simply, he put the best people in the right jobs and let them figure it out, providing guidance only when necessary. One of President Lincoln’s personal strategies was to ensure he did not get too far from the fray personally. Along with other great managers, he knew how important it was to see for yourself, to touch the people who do the work, and to test what you’ve heard. In Lincoln, Mr. Spielberg shows the ‘president not afraid to court votes himself from time to time — even meeting with Democrats he knew he had little chance of convincing.’ How difficult but how necessary it is to talk to everyone, even those who disagree with you. No other way can you exert influence on those who think differently than you. Our image of President Lincoln is of a folksy, soft-spoken, backwoods, ax-wielding man of extreme intelligence gleaned from reading the world’s great books by candlelight. Watching Lincoln you’ll see glimpses of his inner fire, ‘most notably when he loses his temper and delivers a passionate rant about the nobility of the Union cause.’ Why did he express his anger at that moment? To keep his divided Cabinet from giving up on the amendment. I can only imagine the emotional intelligence of this man. President Lincoln was very close to his youngest son, Tad, who had a genuine interest in the Civil War and its legacy and purpose. Innocently, Tad influences his father through their father/son discussions because his conscience ‘reinforced [his] father’s morality.’ Isn’t it a wonderful thing to learn from others when their intent is really just to question? Often the most innocent question or comment can lead to extraordinary insight and reflection. We can all learn about being good managers — and good people — by understanding how our late President worked with others, trusted, persevered, loved his family and country, and never lost sight of what he wanted to do. I too was moved by Spielberg’s movie..and would add to this comprehensive list – bridled passion. Lincoln believed passionately in his purpose, while ensuring simultaneously that he maintain his considered approach in order to achieve success. He recognized that his long-range goal required that he understand the implications of the opinions of those with whom he disagreed. As such, with no diminution of his conviction, he approached his goal with a clear-eyed perspective of his entire audience. Not just those who shared his view. What you wrote would have been a superb closing paragraph to my blog. I really appreciate the phrase ‘unbridled passion.’ A few minutes ago I read a blog posted by a fellow who changed his career to enter the world of renewal energy and housing. Now he’s running a successful firm — as he too had unbridled passion. Think about the pushback he must have received years ago when saving energy and generating it in new ways was nearly science fiction. Along the same lines, I just finished an employee forced-ranking engagement and one of our criteria was passion. If you don’t have it, no matter how good you are at your task, you’re unlikely to achieve long-term goals. Enjoy the holidays, and thanks (as always) for reading my posts. At the Battle of Fort Stevens in 1864 Lincoln actually came under Confederate fire, making him the second and last sitting president to be in such a position, the first being James Madison at the Battle of Bladensburg in 1812. At 6’4” Lincoln stood a foot taller than Madison, greatly increasing his peril. 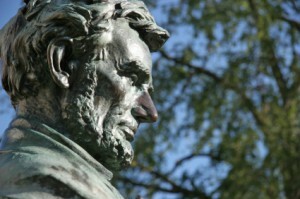 This episode was not an exception to Lincoln’s involved role in the war. As commander-in-chief, Lincoln exercised the highest authority over the American military. Applying his old talent for self-education, Lincoln began to voraciously study the principles that composed contemporary military thought. He made the decision to resupply Fort Sumter , which prompted the Confederate barrage igniting the Civil War, and continued to take an active hand in formulating the grand strategy of the war. Lincoln appointed every top general in the Union army, including Ulysses S. Grant. Aides would often find him in the telegraph office poring over dispatches from the field—some days he would visit the office four or more times. In addition to making frequent appearances in camps and at parades, Lincoln even personally tested such new pieces of military technology as the “coffee-mill” machine gun and the Spencer repeating rifle . Yes, I recall this about our late president. He must have been so incredibly smart with a remarkable memory and ability to balance equally brilliant minds around him while his country was falling apart. I appreciate that he also got into the weeds, testing rifles on the White House grounds.